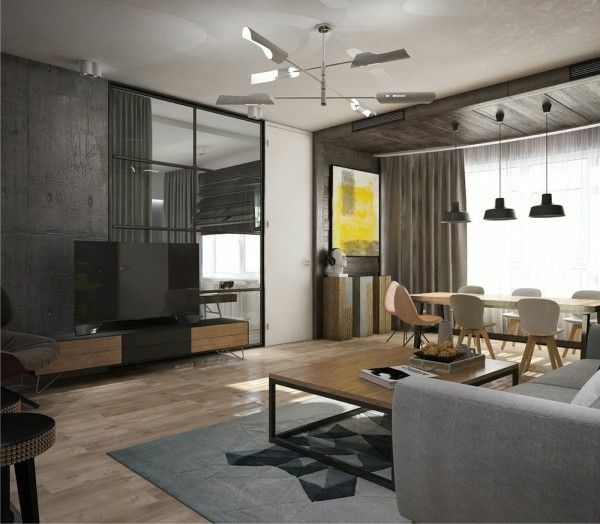 1 | Visualizer: Pavel AlekseevThe first space is built around the central living area, with private spaces spiraling off of that main room. 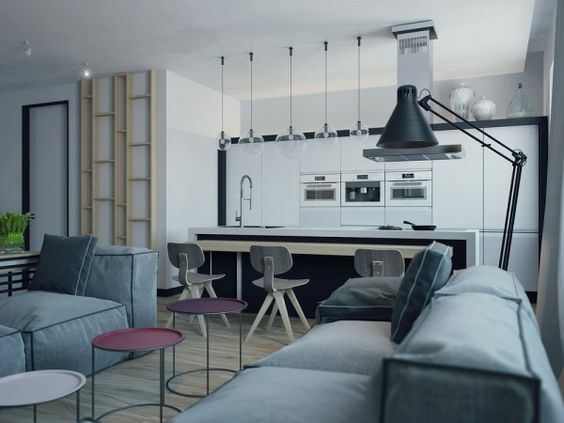 Tall ceilings make for an open atmosphere and light fixtures are kept close to the ceiling in a way that ensures the space does not become too closed off. The bedroom and guest room are both visible from the main living area through interior windows, with curtains that can easily be closed when privacy is required. The color palette is largely neutral with a few brighter pops of yellow for a youthful glow. 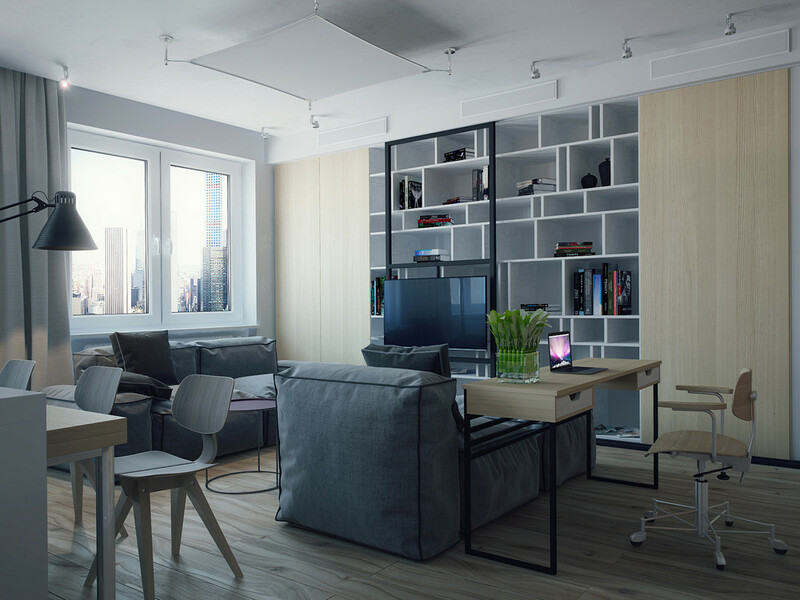 17 | Designer: Alexander SimakovThe second home is a 70 square meter (753 square feet) studio who had limited space but still wanted to be able to host parties. iN order to accomplish that, the designer has left the floor plan open and make the different larger pieces easy to move and slide around to create a central gathering (and karaoke) spot. Despite the small size there is still plenty of seating, a comfortable work space and a cozy dining area. 10 | The interior dining area uses Eames chairs and a simple table to keep things feel open. 12 | The designers even managed to tuck a laundry area in, which means less time lugging clothes to a laundromat and more time at home with your honey. By the way, if you are looking for beautiful and efficient ideas for laundry storage do check out our post covering unique laundry baskets. When a couple is just starting out it can be a challenge to find a place that is both affordable and comfortable so that they can embark on their new life together. 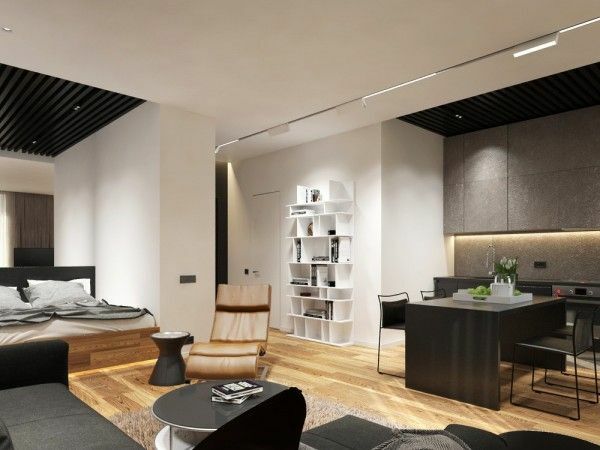 Studio apartments for couples may seem cramped while bigger modern apartments are just too large for those who might be saving up to have a family soon. 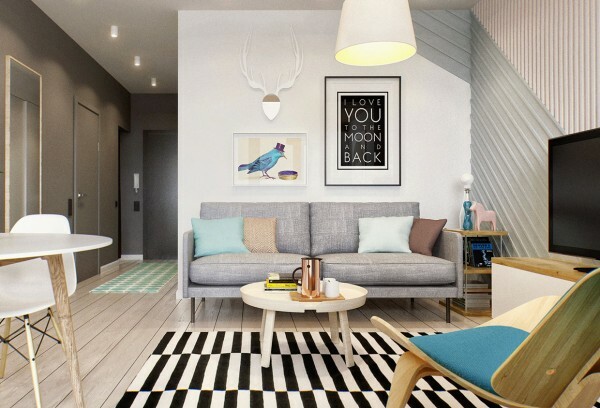 The three apartments featured here offer limited space, but make up for it in the creative use of that space, making room for the couples as well as their favorite pastimes. 2 | The desk chairs used here are the Eames wire chairs. These wired chairs are quite versatile and can function as modern outdoor chairs as well. 23 | A mirrored entryway wall is essential for those last minute outfit checks. 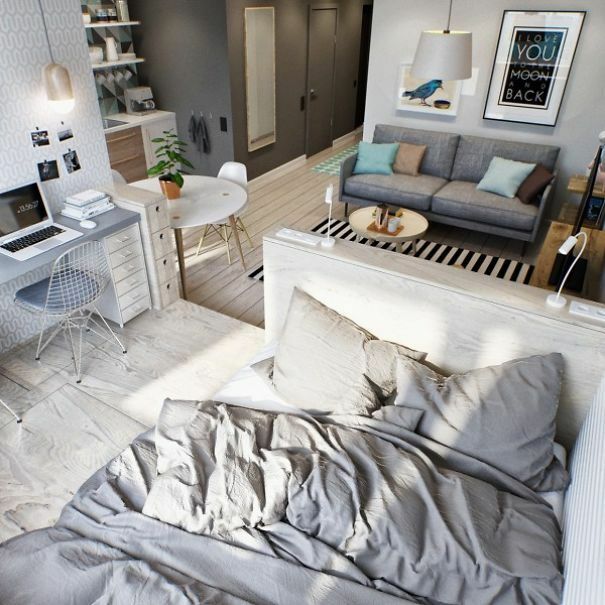 4 | The bed is in a small lofted area, which also includes a shared workspace. 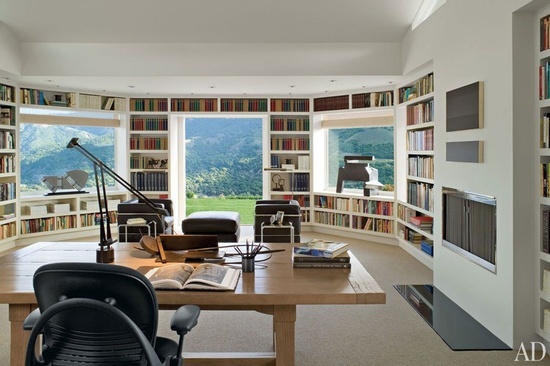 8 | Vertical storage – here and inside the main room – is key to making a small space like this work. 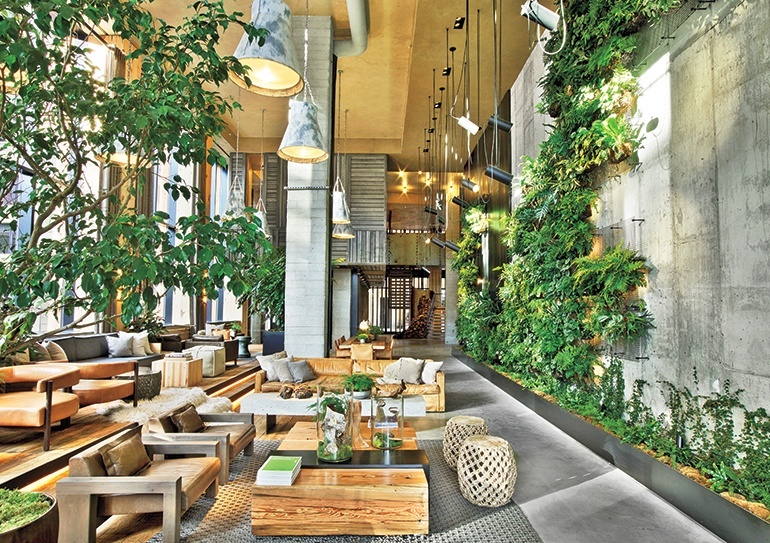 The indoor plants help add some life too. 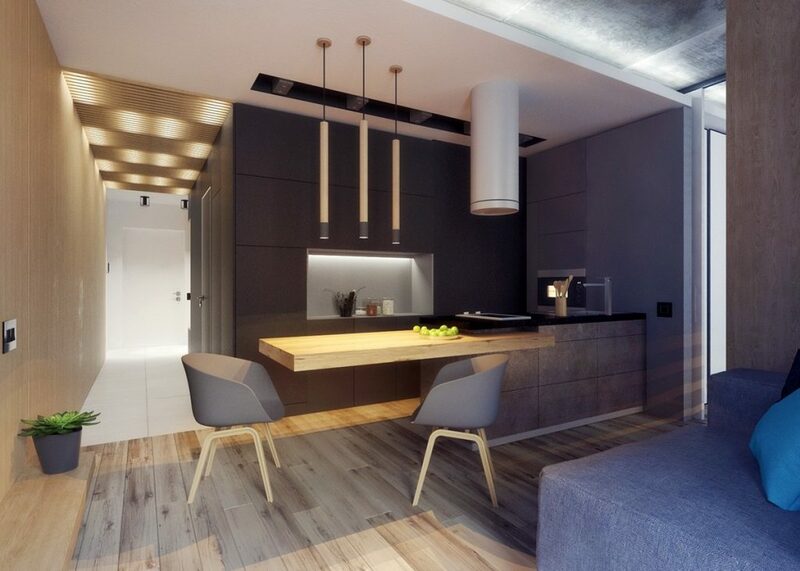 19 | The black kitchen stools and pendant lights provide good contrast against the lighter shades in the backdrop. 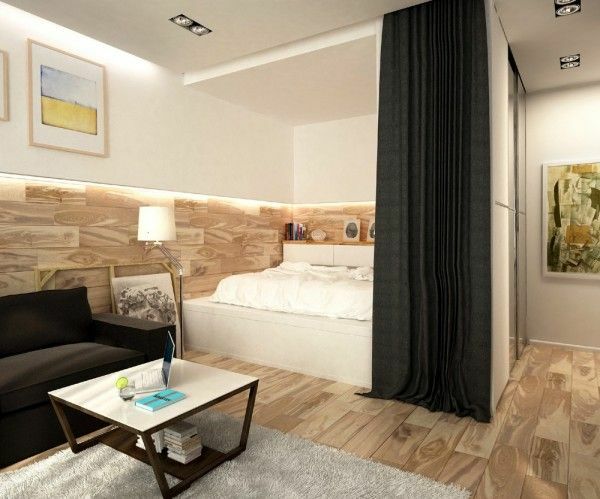 17 | The full sized bed sits in a cozy cubbyhole and can be hidden from view in the event of guests. 21 | With a stone wall and modern appliances, the kitchen is simply spectacular. 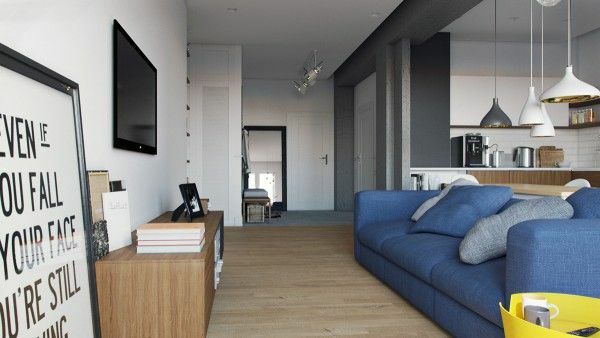 18 | The living room gets plenty of natural light, which works well with the natural materials used throughout the home. Being a young couple can be a challenge. You may just be starting out in your careers, saving to buy a home, or just trying to find your footing in the world. On top of that, moving in together for the first time is stressful. 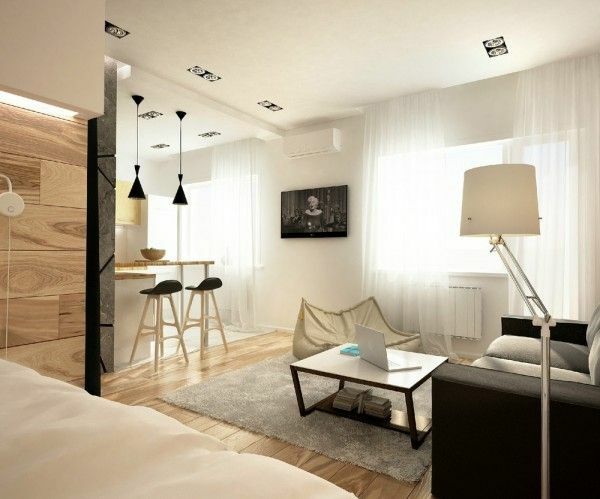 But a few talented designers have decided to take on this challenges, offering two lovely studio apartment designs that would give any pair of newlyweds – or even just lovebirds cohabitating – enough stylish space to spread out and enjoy themselves on their way up the corporate (or artistic) ladder. 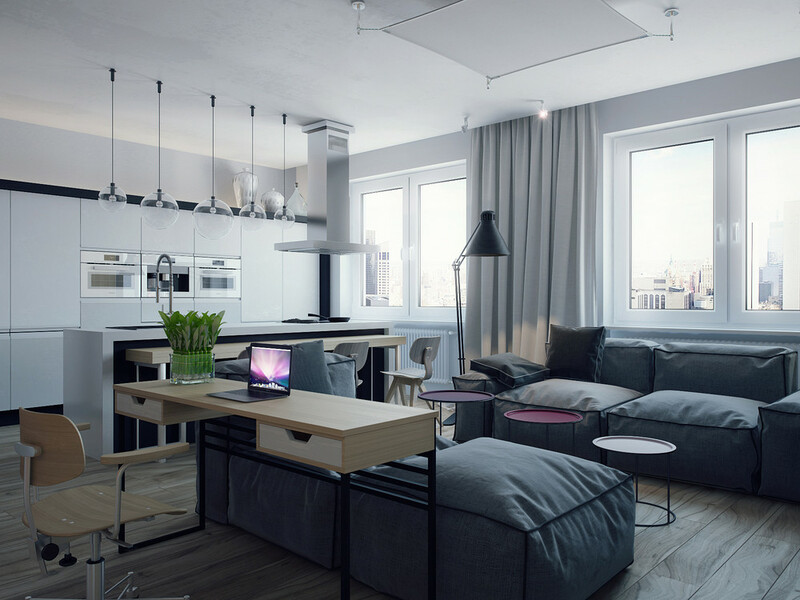 The first apartment comes from the team at int2architecture, while the second is from designer Art Ugol. 20 | The breakfast bar provides a perfect space for a fruit bowl or two, though a dinner party might be difficult to pull off. 7 | A sunny breakfast nook is an amazing place to start a day with your loved one, but it also allows you to shut the door when you need some time to yourself. 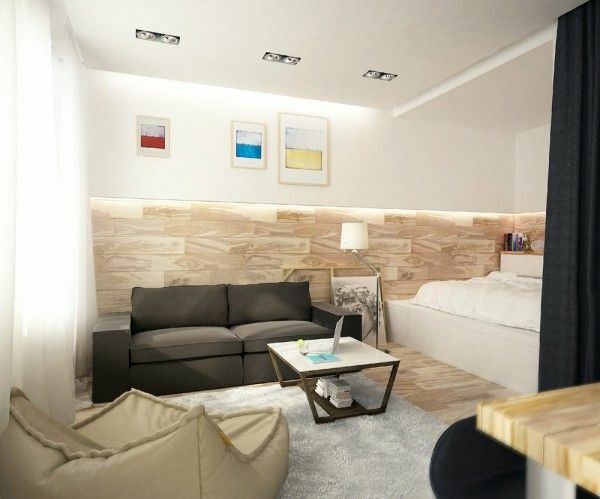 1 | The team at int2architecture designed this one bedroom apartment as a temporary home for a young couple. 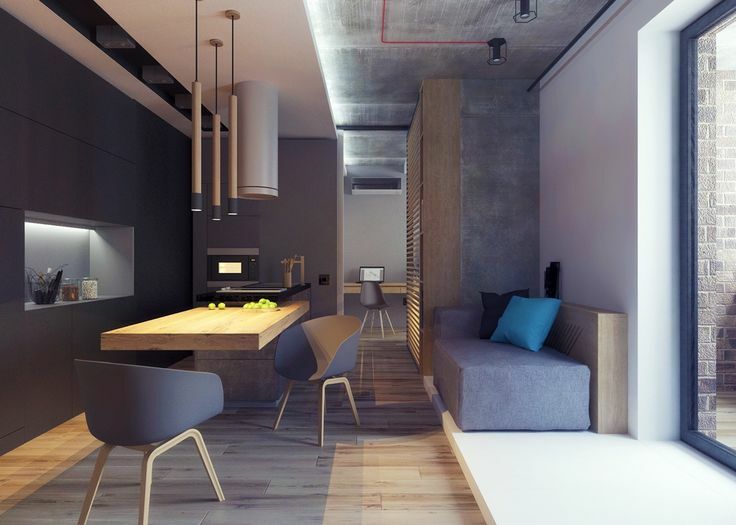 Largely, the design focuses on dividing the small space into useful, separate zones without putting up any walls that would serve to close off the space. 24 | Visualizer: Amplitude Rendering In this last home, the simplicity of the design makes it feel very welcoming and approachable. 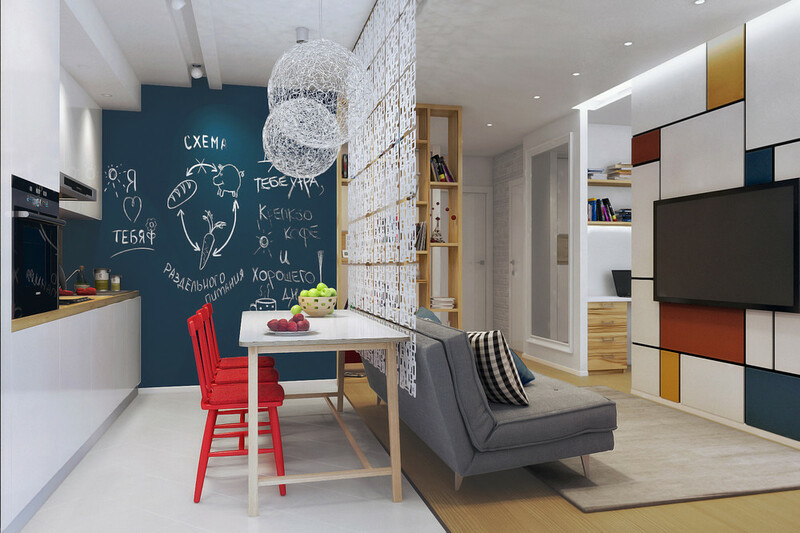 The design is for a young family and the vibrancy of the colors in use, as well as the playful fixtures and streaming sunlight, certainly feel as if a child would be able to get along here. 15 | The second apartment was intended for a young female artist, but could easily be suited to a pair of artists as well. 25 | A sleek tiled bathroom with cool, 80’s-inspired fixtures is just artsy enough without losing any functionality. 13 | We particularly love the creative herb storage, perfect for a couple that loves to cook.